Web 1.0, web 2.0, web 3.0 and web 4.0 were described as four generations of the web. The characteristics of the generations are introduced and compared. It is concluded web as an information space has had much progress since 1969 and it is moving toward using artificial intelligent techniques to be as a massive web of highly intelligent interactions in close future. Web 1, 2, 3 ,4 ... Each level seems to distance the user from the material and technical contingencies, to bring transparency in the exchanges and to open on new functionalities. And since the function creates the organ, it profoundly changes the whole of society. Web 1.0: it makes computers talk to each other. We replicate what already exists at the level of contents and dynamics, we remain in the diffusion, of a person towards several. It can be the simple transposition of a product catalog on a commercial site. Web 2.0: it makes people talk to each other. Internet users are participants. They are both "consum'actors" and "consumers". They interact. They bring value to the network and tools with the data they publish and manipulate. Web 3.0: it makes objects talk to each other, with the emergence of the mobile web and the semantic web. 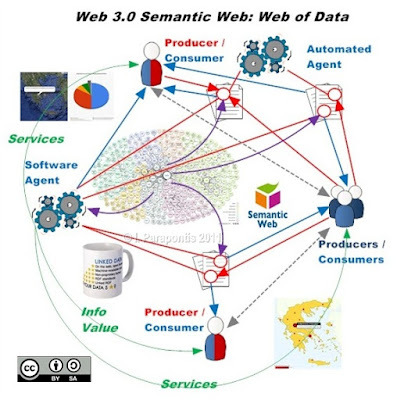 We also speak of the conjunction of the semantic web and the Internet of Things . The information is enriched. For example, the date 01 April 2024, which was previously just a succession of characters, becomes an object recognized as a date by the programs. Thus, she can become April 1st, 2024 in a system that translates dates into American English. We can also ask for dates after January 1, 2024, so include documents, such as this one, that speak of April 1, 2024. The same goes for people, places, telephone numbers, geographic coordinates. In short, all that can benefit from not being only text, and take meaning (hence the semantic adjective). The web is intended for these semantic developments with attributes that page developers can add, which allows to.. 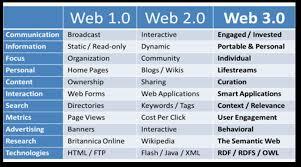 Web 4.0: according to David Fayon, in Web 2.0 and beyond  , it will be about adapting the objects to the behaviors, habits and preferences of the user leaving room for the implicit. This web is not for now, because it requires phenomenal processing power, which could meet the barrier of the evolution of computer components, or the depletion of natural resources. Let's not forget that the internet is becoming more and more greedy in electricity. 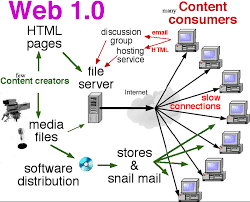 Web 0: The Internet was officially created in 1989 with a proposal from Tim Berners-Lee, a computer scientist working at the European Organization for Nuclear Research (CERN). He proposed an open computer network to keep track of research at CERN. He implemented the first successful communication between a web browser and a server via the internet that next year. Beginning with that first website in 1991, the World Wide Web Project, Berners-Lees lobbied professors, students, computer programmers and Internet enthusiasts to create more browsers and servers for the internet. Web 1.0 : By 1999, there are approximately 3 million web sites . The majority of these sites are static, read-only sites. Users preferred to navigate the web through link directories of Yahoo. Web 1.0 era consisted of search engines. 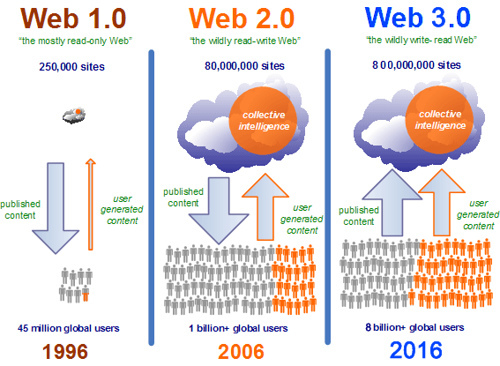 Web 2.0 : While Web 1.0 was the read-only Internet, Web 2.0 is the read-write Internet. 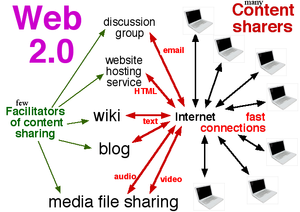 Web 2.0 participates in content creation through sharing and collaborating, such as social media and blogging. By 2006, there are approximately 85 million websites . In Web 2.0, the two game-changers for the Internet are Wikipedia and Facebook. As discussed in the Socially Enabled Helpwiki, Web 2.0 is really the beginning of collaborative problem solving using the Internet. Individuals query users, via a help website, regarding a problem or issue they may have and receive help from users in their area, country, or anywhere across the globe. As help websites like web forums and wikis mature, along with the Web, business becomes more adept at leveraging these communities to their advantage. 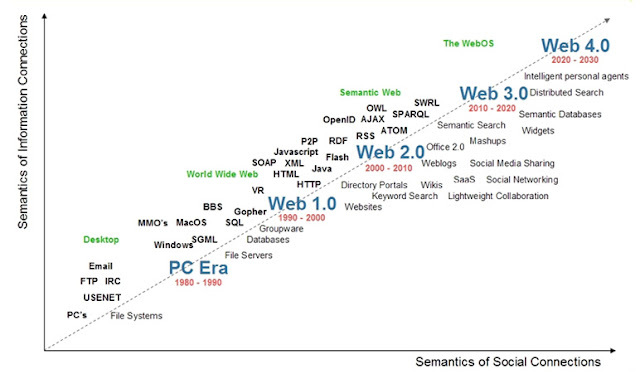 Web 3.0 : The newest form of the Internet, our current Web 3.0, is known as the semantic web. By combining a semantic markup and web services, Web 3.0 promises the potential for machine readable content, developed so machines can directly interact with each other. Web 3.0 means to standardize the systems, languages, publications and tools that have already been developed, as well as provide structure to date and link systems more efficiently for reuse across various applications. Semantics merely add extra information to help users understand the meaning of the information. Web 3.0 links various data items together, (examples such as people, books or songs) to create context, and, in turn, context gives meaning. Web 3.0 also sees the emergence of 3D virtual and interspatial internet, this application goes beyond gaming and is rapidly evolving. Signs of Web 4.0 abound, according to the Forbes magazine article, The Five Most Disruptive Innovations at CES 2014, innovations like wearable devices and embedded sensors are already being developed . By 2016, the Internet has more than 8 billion websites. Web 4.0 is an open, linked and intelligent web. Web 4.0 will also load web pages quicker with impeccable results.According to computer engineers Sareh Aghaei, Mohammad Ali Nematbakhsh, and Hadi Khosravi Farsani, Web 4.0 will be comparable to the human brain . It is often characterised as the Web OS – the entire web being a single operating system where information flows from any one point to any other. Web 4.0 is also known as symbiotic web. The goal of the symbiotic web is interaction between humans and machines in symbiosis. The line between human and device will blur. Web 4.0 will interact with users in the same way that humans communicate with each other. Web 4.0 environ will be an “always on,” connected world. Users will be able to meet and interact interspatially on the web through the use of avatars. According to futurist Daniel Burrus, phones and other devices will no longer require screens to navigate the internet . Other entertainment systems, such as televisions, will rely on holograms to communicate information . 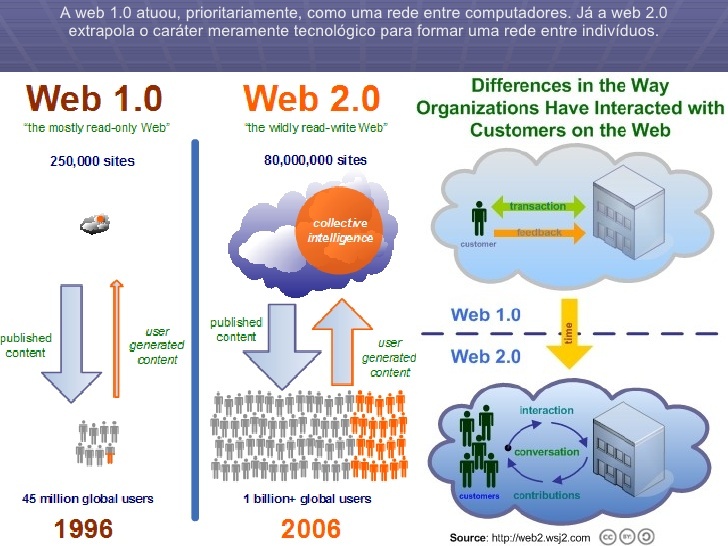 According to the founder of Squidoo Seth Godin, Web 4.0 will require ubiquity, identity, and connection  . Throughout the last few decades, Hollywood has produced their vision of the future involving the use of computers. Ironically, many screenwriters, producers, and directors were close with their prediction and depictions of computers. Films such as Stanley Kubrick’s 2001: A Space Odyssey and Spike Jones’ Her present their own ideas regarding the future of computers and connectedness. When Web 4.0 becomes a mature system, it will create a new symbiotic relationship between humans and machines. The emergence of Web 4.0 human – machine communication has already begun. Currently, alarm companies and cable companies have the ability to link two very different businesses for mutual benefit. Consumers now have access to cheap home security using pre-existing broadband and inexpensive web cameras. The symbiotic relationship will extend to Web 4.0 by acting as a personal assistant or agent for the user. Through the use of facial recognition, an ultra-intelligent electronic agent  will recognize users whenever they log onto an internet connected device. 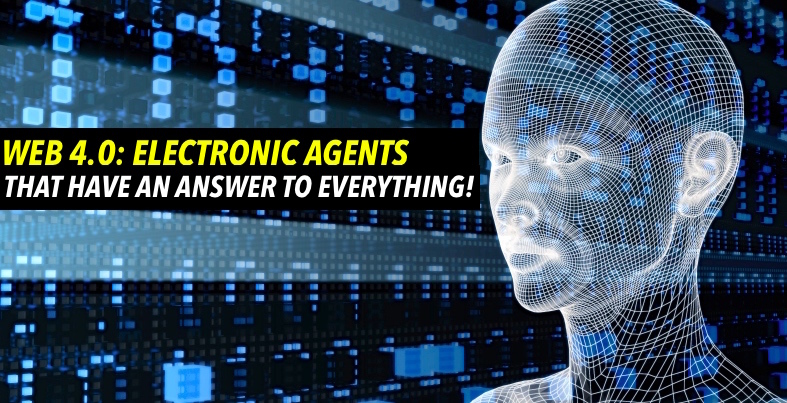 The ultra-intelligent electronic agent will constantly be available. The user will determine its’ look and personality via an avatar. Ask the agent a question and it will answer. It will also be intuitive of the user’s needs. Here is an example of available uses of Web 4.0. Perhaps you are going to a convention and need to book a hotel. Once you are registered for the convention, a window will pop up with suggestions for hotels in the area based on your previous booking criteria. Already there has been integrations of Web 4.0 in our everyday lives. For instance, when a user visits Youtube or Amazon and creates an account, recommendations for videos and books are listed based off previous searches . Web 3.0 began the development of machine-readable content for Web 4.0. This means that smart appliances will be connected to the Internet and will be able to perform tasks without human involvement. For example, through the use of radio frequency identification tags (RFID), your refrigerator will be able to sense that it is running low on milk, and it will contact the grocery store to order more milk. Then, the refrigerator will send you a message on your smart phone to pick up the milk on your way home from work. RFID tags are tracking devices that are already used in cars that use toll highways. They are also used in supply chain systems and automotive assembly and farming. The use of RFID tags will greatly increase in Web 4.0. RFIDs will create a living, connected web of content, all linked to the Internet. Imagine having all food items tagged at the grocery store so you do not have to unpack your order at the check-out. The cashier, if there is one, will simply scan your whole cart and give you the grocery total. Web 4.0 will also allow grocery store management to properly predict how many products they should carry. This will also allow grocery stores to decrease the amount of wasted food, like perishables such as fruit and vegetables . With the connected web, an individual, when traveling home, may pass a grocery store and will be instantly notified to pick up something he or she may need, such as milk . Another fundamental characteristic, as noted by Karan Patel, is the combination of virtual reality into the user’s everyday life. For instance, the user will be able to Google their home to search for misplaced items, such as car keys or a cellphone . With the integration of Web 4.0 into daily life, even travel directions will be revolutionized . Constantine Valhouli suggests that Google Maps will soon contain mash-ups providing directions, narratives, and coordinates . It can provide instructions that reduce ten minutes of typical commuting time by providing alternative route. However, according to Faris Yakoub of McCann Erickson, New York, one of the most innovative characteristics of Web 4.0 will be the integration of social media into travel . Yakoub uses the example of re-routing your way to work in order to bump into an old friend , or if taking a ‘sick’ day off of work, an individual may be able to avoid their boss. Both of these are examples of how Web 4.0 can reinvent social interaction. As mentioned, the use of RFIDs is already commonplace in many industries, and is constantly expanding. Another area that will be very different with Web 4.0 is retail shopping. With the development of 3D browsers, shoppers, via their avatar, will be able to virtually and interspatially travel the web and go into showrooms and stores to browse for products they like. If they decide to purchase an item, they would receive a message on their device from their personal assistant letting them know if same item is less expensive at another site. Author Lief Larson suggests that Web 4.0 will revolutionize customer service because of the complete control of the customer. Customers will access a particular website, such as Amazon or Ebay, and will use audio and video equipment to communicate their requests with a noted representative of the business. Journalist Jean-Paul Edwards writes that companies will be able to establish links with other companies using Web 4.0 to offer new services at a lower price . Edwards references the merger of Comcast and AT&T, which link two very different businesses for mutual benefit offering an inexpensive home security system using the Internet and video surveillance, allowing homeowners to continuously check in on their homes. Web 4.0 will allow various types of companies to share information and combine their services for everyone . In addition, Edwards notes the impact on other services such as bus transportation. Edwards uses the example of Google Driverless cars that rely on signals from signs in order to navigate buses on their respective routes. Although this could save money by eliminating the cost of bus drivers, liability and legal issues still need to be addressed. Building construction will also be affected because buildings typically have 20-30 environmental systems, such as lighting and water . Web 4.0 will literally be the “Internet of Things,” as every appliance will be given an IP address. Constantine Valhouli also suggests that the market industry will soon develop the first “intelligent buildings”. These buildings will have an IP Platform in which all of the building systems will be integrated using Web 4.0. Sensors will also be placed in the building systems and appliances and will be able to detect if there are changes. One building that has already experimented with Web 4.0 in their building systems and appliances is the Hotel 100 in Seattle, Washington. At Hotel 100, minibars in every room of the hotel are wired to the Internet. Streams of data can be instantly transferred from the minibar back to hotel management. Matt Hagerman, the general manager of the Hotel 100, claims that this connectivity allows hotel management to recognize the needs of guests, and even grant them special perks. For instance, if a guest purchases ten drinks from the minibar in their hotel room, Hagerman and his staff receive data information, and, in turn, will send the guests a round of free drinks. Hagerman even admitted to surprising some guests with a bottle of Jack Daniels the next time they book a hotel stay, and additionally claims that Web 4.0 will revolutionize businesses, (like Hotel 100). The integration of “intelligent buildings” and connected IP Platforms allows Hagerman’s employees to focus on other tasks, while the intelligent system automatically enters the data from the minibar . Biomedical chip implant technology, currently in its infancy, will emerge with Web 4.0 to alleviate many diseases of the body. As of October 2014, a woman in a Toronto hospital has partial sight restored after a surgery that placed retinal implants in her eyes . Biomedical chip implants bridge the gap between human and machine, allowing the machine to communicate with the brain and to restore function that was previously lost to disease. Another Web 4.0 example of the symbiosis of human and machine is the Braingate Neural Interface System  which is being developed by a team of physicians, scientists and engineers from Brown University. The goal of Braingate Neural Interface System is to re-enable the severely disabled, and give them the ability to control a cursor on a computer screen or to type on a virtual keyboard, simply by thinking about the movement of one’s own hand. 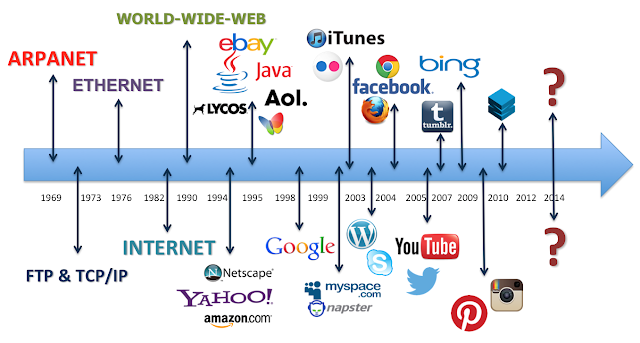 Since 1989, the Internet has progressed from read-only sites to the current, semantic web of 3.0. 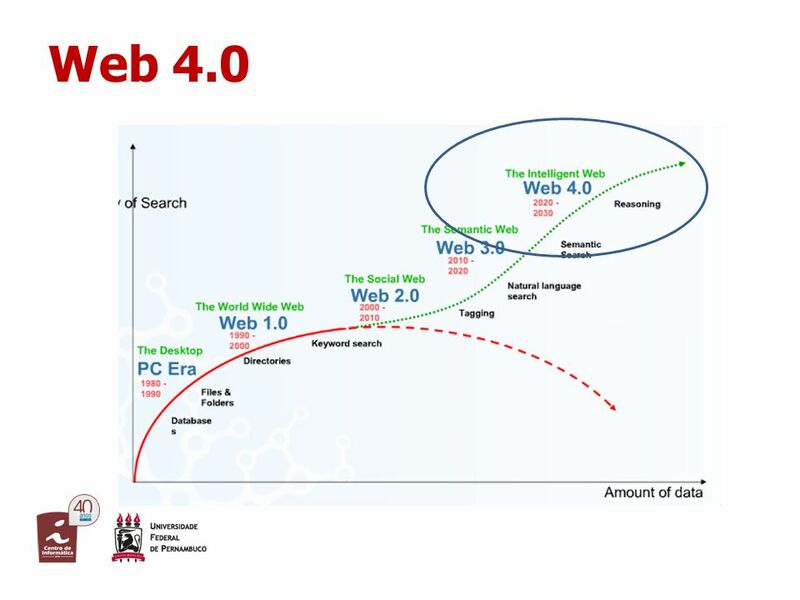 The web of today will eventually progress into the ultra-intelligent, open linked, Web 4.0. The future web of 4.0 will provide connections between human and machine to create interactive data for a new, symbiotic Internet. Expectations of constant connectivity in Web 4.0 will affect many sectors of daily life. The use of Web 4.0 in everyday activities will help symbiosis between humans and machines. With the use of intelligent data, virtual realities will become more and more common. Introducing RFID tags into appliances regularly found within a home will help connections not only between humans and machines, but also interrelations between machines. These appliances and applications will be intuitive to the users’ needs . Web 4.0 will also change the future of both business and medical fields. Again, RFID tags will be added to different businesses to help improve the experiences of shoppers. Web 4.0 will be consumer driven, and will give complete control to the shoppers. Additionally, the symbiotic web will help create “intelligent buildings.” Similar to helping improve users’ lives, the “intelligent buildings” will use sensors and IP platforms to continuously update information about the individual staying at the hotel . The connection between buildings and machine may one day remove the need for hotel personnel. Moreover, the medical field will greatly change with the future inclusion of Web 4.0. Medicine will ultimately support the interconnection of human and machine, allowing ill patients the ability to heal with symbiotic systems. The future of Web 4.0 is meant to revolutionize the daily lives of humans. By creating interrelationships between human and machine, Web 4.0 will give users unique and interconnected social and personal lives. This open, linked and intelligent interface will be the future of the Internet. nothing is impossible, is this possible? Web 8.0 true omnipotent powers, able to reshape reality itself etc..﻿﻿ Web 9.0 ??? Web 10.0 ??? May 29, 2018, titled "What is the World Wide Web and what is its future? What could it be, what should it be? What is the Web we want?